The United Brethren Discipline for 2005-2007 has now been posted online. You can view the individual chapters, or download a PDF of the whole document. 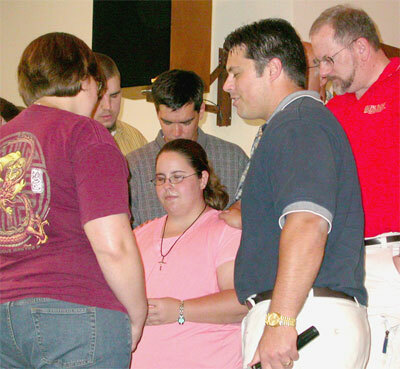 Pastor Tim Hallman of Anchor Community Church (front, right) prays for Tabatha Lamb as she prepares to head for Vietnam. On June 26, Anchor Community Church commissioned Tabatha Lamb as a missionary to serve in Vietnam with the English Language Institute/China. She arrived there in August, and is now involved in teaching English as a second language. Tabatha is a 2005 graduate of Taylor University-Fort Wayne. Anchor has a strong relationship with Taylor University’s Fort Wayne campus. A number of students attend Anchor, and some have served in the tutoring, mentoring, and concert ministries, as well as in VBS and other church ministries. Amanda Heinsch, a current student, received support from Anchor to spend two months this summer in Turkey with the Caleb Project. On September 25, she gave a presentation about her work in Turkey. Another former Taylor student who attended Anchor has been serving since around 1999 in Azerbaijian. She is involved in Christian literature work. She has received annual support from Anchor’s missions fund. On September 18, Anchor started a second Sunday morning worship service. The two services now meet at 9 a.m. and 10:30 a.m., with Sunday school during the second hour. During this year’s Homecoming activities, Huntington University gave out its annual outstanding alumnus awards. Kathleen Krum, a 1971 graduate, was given one of the two Alumnus of the Year awards, which recognize outstanding achievement during the past year. She was honored for her work in environmental education programs. The other Alumnus of the Year award went to Doug Slaybaugh, who graduated in 1978 with a degree in Psychology. Since 1995, he has served with Saddleback Church and its related Purpose Driven ministry. He is now CEO and President of Purpose Driven Ministries. Dr. Emmett Lippe was selected to receive the University’s Distinguished Alumni Citation, which recognizes achievement over an extended periof of time. Lippe, a 1964 graduate, has received a variety of honors for his educational contributions in Michigan. Doris MacDonald, a UB endorsed missionary, has recorded a second album with her musical partner, Sharon Dennis. You can obtain a copy through their website, The Braeded Chord.